Etymotic Research ER4SR Review – IEMs at Their Best? Compared to some of the other models on our list of the best studio headphones under $500, there isn’t a great deal to talk about in terms of design, although still plenty to get excited about. With a sleek and simple in-ear design, the American-made ER4SRs feature lightweight anodized metal bodies with a stellar build. As for what sits in your ears, the ER4SRs come with a range of tips to cater for all users, comprising two pairs of standard 3-flange tips; two pairs of large 3-flange tips; and two pairs of large black foam tips. This flexibility makes for a comfortable pair that won’t irritate after long hours in the studio. They are also excellent at blocking out external noise, so use on the go is very feasible with this pair. As Etymotic Research rightly boasts, the ER4SRs are ‘the only earphones with balanced-armature, precision-matched, custom-tuned drivers’. In terms of specs, this translates to an impedance of 45 ohms, a 98-dB sensitivity, and a frequency response of 20 Hz to 16 kHz. 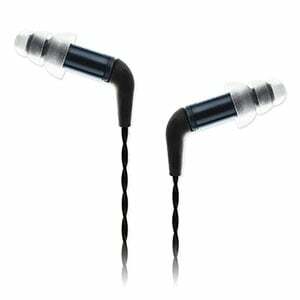 This pair also features filters at the end of the earphone, which help smooth frequencies and protect the drivers. As with all filters, these can get clogged after time, but the ER4SRs come with replacement filters as well as a filter removal tool. The detachable braided cable is strong and durable, and around 1.5 meters long (5ft). As you would expect for a sub-$500 price tag, accompanying the headphones in the box is a 1/4” stereo adapter, a shirt clip, and a deluxe zippered storage case to keep everything in (this is a little bulky, but does the job). Unlike Etymotic Research’s other ER4 model – the ER4XR (which features enhanced bass) – the SRs have been built for a completely flat response across all frequencies. And they certainly deliver! Casual users will find them lacking a bass thump, but they are a critical listener’s dream – very clear, incredibly smooth and neutral. They set the bar very high for both IEMs and studio headphones in general. Hard to fault! For audiophiles, studio producers and anybody who wants an accurate sound for precision mixing, the ER4SRs will do the job and then some! They aren’t cheap, but they aren’t your regular set of in-ear phones. The build, comfort and tech justify the price of these IEMs, which should be on the shortlist of any critical listener. For more info about the Etymotic Research ER4SR, click here. For more Studio Headphones Under $500, click here.